Two-time Academy Award-winner (Best Actress, Boys Don't Cry, 1999, Best Actress, Million Dollar Baby, 2004) Hilary Swank shines in her first starring role as The Next Karate Kid, co-starring Oscar - nominee (Best Supporting Actor, The Karate Kid, 1984) Noriyuki "Pat" Morita. When her parents are killed in a car accident, 17-year-old Julie Pierce (Swank) falls under the wise and patient guidance of Mr. Miyagi (Morita), who teaches the su..
Own Karate Kid / Karate Kid 2 / Karate Kid 3 DVD from Deff, DVD, Blu-Ray & 4K Video Specialists - Free UK Delivery.. There is more to karate than fighting. This is the lesson that Daniel (Macchio), a San Fernando Valley teenager, is about to learn from a most unexpected teacher: Mr. Miyagi (Morita), an elderly handyman who also happens to be a master of martial arts. So when he rescues Daniel from the Cobra Kai, a vicious gang of karate school bullies, Miyagi instils in his young friend the importance of honour and confidence as well as skills in self..
Ralph Macchio stars as Daniel Larusso, a teenage boy who is taught karate from martial arts master Mr Miyyagi (Pat Morita), to combat the bullies who are making life difficult for him at his new school. Under the tuition of Mr Miyagi, Daniel soon comes to learn that karate is a mystery over self - mind and body - and that fighting is always the last answer to a problem. However, it is not long before he must face his greatest enemy in a.. When Dre Parker (Jaden Smith) and his mother (Taraji P. Henson) move from Detroit to China, Dre feels lost in a world very different from what he knows. Bullied and beaten up by some fellow students in his school, Dre is rescued by his apartment building's handyman, Mr.Han (Jackie Chan), a man who is mourning a devastating loss. Mr. Han takes pity on Dre and agrees to teach him kung fu to defend himself. Training together, teacher and s.. When Dre Parker (Jaden Smith) and his mother (Taraji P. Henson) move from Detroit to China, Dre feels lost in a world very different from what he knows. Bullied and beaten up by some fellow students in his school, Dre is rescued by his apartment building's handyman, Mr. Han (Jackie Chan), a man who is mourning a devastating loss. Mr. Han takes pity on Dre and agrees to teach him kung fu to defend himself. Training together, teacher and .. Returning with Daniel (Ralph Macchio) to his Okinawa home for the first time in 45 years, Miyagi (Noriyuki “Pat” Morita) encounters Yukie (Nobu McCarthy), the woman he left behind when he immigrated to America. And just as Daniel falls in love with her teenage niece Kumiko (Tamlyn Tomita), two enemies arise to challenge both couples’ happiness: Sato (Danny Kamekona), the man whom Yukie was once supposed to marry, and Chozen (Yuji Okumot.. 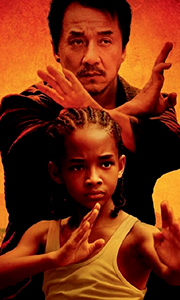 The Karate Kid When he is plagued by attacks and the cruel jokes of a gang of vengeful kids, a young teenager takes karate lessons in the hope that it will make him strong. In the end he learns the more important lesson, that fighting is the last answer to a problem, not the first. The Karate Kid II Sequel to 'Karate Kid' which continues the story of a young man growing up under the guidance of his Japanese mentor, Daniel and Miyagi tr.. Celebrate the 35th anniversary of the coming-of-age classic – from Academy Award®- winning director John G. Avildsen (1976, Rocky) – that will leave you cheering! There is more to karate than fighting. This is the lesson that Daniel (Ralph Macchio), a San Fernando Valley teenager, is about to learn from a most unexpected teacher: Mr Miyagi (Noriyuki “Pat” Morita in his Academy Award®- nominated performance, Best Supporting Actor, 1984),..